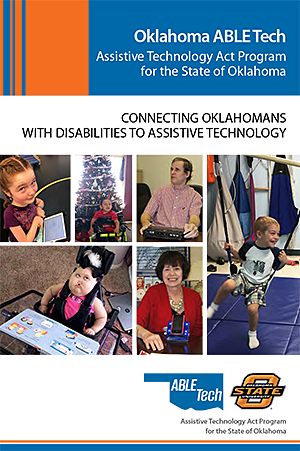 Oklahoma ABLE Tech is the statewide Assistive Technology Act Program located at Oklahoma State University in the Department of Wellness. ABLE Tech is funded through the Administration for Community Living of the U.S. Department of Health and Human Services, and maintains coordination and collaboration efforts with partners throughout the State of Oklahoma. The funding provided helps enhance the opportunities for Oklahomans with disabilities to access and acquire needed assistive technology. Our mission is to improve access to and acquisition of assistive technology for individuals with disabilities of all ages. Assistive Technology (AT) is any item, device, or piece of equipment used to maintain or improve a person's capabilities, allowing them to function independently in recreation, education, employment, and daily living activities. Download and read our brochure. We also provide outreach, information and assistance services, and training on various AT topics, as well as collaborate with state and local agencies and organizations to enhance the understanding and access to AT.